Adaptive integration algorithm of Gauss-Kronrod. The maximal error between Gauss and Kronrod approximations. The rule that fixes the number of points used in the Gauss and Kronrod approximations. where , , , and . The Gauss-Kronrod algorithm evaluates the integral using the Gauss and the Konrod approximations. If the difference between both approximations is greater that maximumError, then the interval is subdivided into 2 subintervals with the same length. The Gauss-Kronrod algorithm is then applied on both subintervals with the sames rules. The algorithm is iterative until the difference between both approximations is less that maximumError. In that case, the integral on the subinterval is approximated by the Kronrod sum. The subdivision process is limited by maximumSubIntervals that imposes the maximum number of subintervals. The final integral is the sum of the integrals evaluated on the subintervals. getMaximumError() Accessor to the maximal error between Gauss and Kronrod approximations. getMaximumSubIntervals() Accessor to the maximal number of subdivisions of . getRule() Accessor to the Gauss-Kronrod rule used in the integration algorithm. integrate(*args) Evaluation of the integral of on an interval. setMaximumError(maximumError) Set the maximal error between Gauss and Kronrod approximations. setMaximumSubIntervals(maximumSubIntervals) Set the maximal number of subdivisions of . setRule(rule) Set the Gauss-Kronrod rule used in the integration algorithm. Accessor to the maximal error between Gauss and Kronrod approximations. Accessor to the maximal number of subdivisions of . The maximal number of subdivisions of the interval . Accessor to the Gauss-Kronrod rule used in the integration algorithm. The Gauss-Kronrod rule used in the integration algorithm. Evaluation of the integral of on an interval. The error estimation of the approximation. Bounds of the integration interval. ei the associated error estimation. 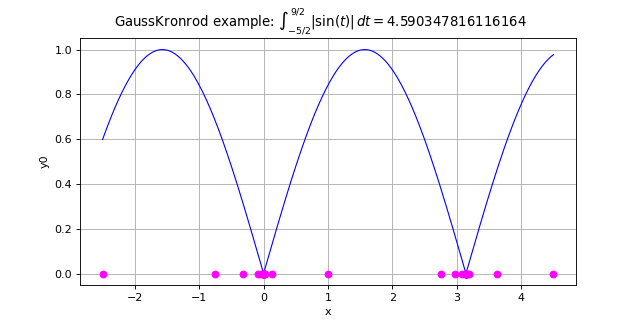 Set the maximal error between Gauss and Kronrod approximations. Set the maximal number of subdivisions of . Set the Gauss-Kronrod rule used in the integration algorithm.